"Chinese food" redirects here. For international Chinese cuisine variations, see § Overseas Chinese cuisines. For other uses, see Chinese food (disambiguation). 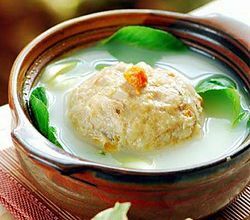 Xièfěn shīzi tóu or "lion's head with crab meat" is a traditional meatball soup from Jiangsu, East China. Crab roes are embedded in the top as decoration. A Quanjude cook is slicing Peking roast duck. Peking duck is eaten by rolling together with scallion, cucumber and sweet bean sauce using steamed pancakes. Chinese cuisine is an important part of Chinese culture, which includes cuisine originating from the diverse regions of China, as well as from Chinese people in other parts of the world. Because of the Chinese diaspora and historical power of the country, Chinese cuisine has influenced many other cuisines in Asia, with modifications made to cater to local palates. Chinese food staples such as rice, soy sauce, noodles, tea, and tofu, and utensils such as chopsticks and the wok, can now be found worldwide. The preference for seasoning and cooking techniques of Chinese provinces depend on differences in historical background and ethnic groups. Geographic features including mountains, rivers, forests and deserts also have a strong effect on the local available ingredients, considering that the climate of China varies from tropical in the south to subarctic in the northeast. Imperial, royal and noble preference also plays a role in the change of Chinese cuisines. Because of imperial expansion and trading, ingredients and cooking techniques from other cultures are integrated into Chinese cuisines over time. The most praised "Four Major Cuisines" are Chuan, Lu, Yue and Huaiyang, representing West, North, South and East China cuisine correspondingly. The modern "Eight Cuisines" of China are Anhui (徽菜 Huīcài), Cantonese (粤菜; Yuècài), Fujian (闽菜; Mǐncài), Hunan (湘菜; Xiāngcài), Jiangsu (苏菜; Sūcài), Shandong (鲁菜; Lǔcài), Sichuan (川菜; Chuāncài), and Zhejiang (浙菜; Zhècài) cuisines. Color, smell and taste are the three traditional aspects used to describe Chinese food, as well as the meaning, appearance and nutrition of the food. Cooking should be appraised with respect to the ingredients used, knifework, cooking time and seasoning. Dàzhǔ gānsī is a typical soup dish of Huaiyang cuisine. It is made of finely sliced dried tofu, chicken, ham and bamboo shoot, and ingredients need to be braised with shrimp in chicken soup. It was highly praised by the Qianlong emperor. Làzǐ Jī, stir-fried chicken with chili and Sichuan pepper in Sichuan style. Steamed whole perch with roe inside. Sliced ginger and spring onion is usually spread on top. Chinese society greatly valued gastronomy, and developed an extensive study of the subject based on its traditional medical beliefs. Chinese culture initially centered around the North China Plain. The first domesticated crops seem to have been the foxtail and broomcorn varieties of millet, while rice was cultivated in the south. By 2000 BC, wheat had arrived from western Asia. These grains were typically served as warm noodle soups instead of baked into bread as in Europe. Nobles hunted various wild game and consumed mutton, pork and dog as these animals were domesticated. Grain was stored against famine and flood and meat was preserved with salt, vinegar, curing, and fermenting. The flavor of the meat was enhanced by cooking it in animal fats though this practice was mostly restricted to the wealthy. By the time of Confucius in the late Zhou, gastronomy had become a high art. Confucius discussed the principles of dining: "The rice would never be too white, the meat would never be too finely cut... When it was not cooked right, man would not eat. When it was cooked bad, man would not eat. When the meat was not cut properly, man would not eat. When the food was not prepared with the right sauce, man would not eat. Although there are plenty of meats, they should not be cooked more than staple food. There is no limit for alcohol, before a man gets drunk." During Shi Huangdi's Qin dynasty, the empire expanded into the south. By the time of the Han dynasty, the different regions and cuisines of China's people were linked by major canals and leading to a greater complexity in the different regional cuisines. Not only is food seen as giving "qi", energy, but food is also about maintaining yin and yang. The philosophy behind it was rooted in the I Ching and Chinese traditional medicine: food was judged for color, aroma, taste, and texture and a good meal was expected to balance the Four Natures ('hot', warm, cool, and 'cold') and the Five Tastes (pungent, sweet, sour, bitter, and salty). Salt was used as a preservative from early times, but in cooking was added in the form of soy sauce, and not at the table. The predominance of chopsticks and spoons as eating utensils also necessitated that most food be prepared in bite-sized pieces or (as with fish) be so tender that it could be easily picked apart. By the Later Han period (2nd century), writers[who?] frequently complained of lazy aristocrats who did nothing but sit around all day eating smoked meats and roasts. During the Han dynasty, the Chinese developed methods of food preservation for military rations during campaigns such as drying meat into jerky and cooking, roasting, and drying grain. Chinese legends claim that the roasted, flat bread shaobing was brought back from the Xiyu (the Western Regions, a name for Central Asia) by the Han dynasty General Ban Chao, and that it was originally known as hubing (胡餅, lit. "barbarian bread"). The shaobing is believed to be descended from the hubing. Shaobing is believed to be related to the Persian nan and Central Asian nan, as well as the Middle Eastern pita. Foreign westerners made and sold sesame cakes in China during the Tang dynasty. During the Southern and Northern Dynasties non-Han people like the Xianbei of Northern Wei introduced their cuisine to northern China, and these influences continued up to the Tang dynasty, popularizing meat like mutton and dairy products like goat milk, yogurts, and Kumis among even Han people. It was during the Song dynasty that Han Chinese developed an aversion to dairy products and abandoned the dairy foods introduced earlier. The Han Chinese rebel Wang Su who received asylum in the Xianbei Northern Wei after fleeing from Southern Qi, at first could not stand eating dairy products like goat's milk and meat like mutton and had to consume tea and fish instead, but after a few years he was able to eat yogurt and lamb, and the Xianbei Emperor asked him which of the foods of China (Zhongguo) he preferred, fish vs mutton and tea vs yogurt. The great migration of Chinese people south during the invasions preceding and during the Song dynasty increased the relative importance of southern Chinese staples such as rice and congee. Su Dongpo has improved the red braised pork as Dongpo pork. The Yuan and Qing dynasties introduced Mongolian and Manchu cuisine, warm northern dishes that popularized hot pot cooking. During the Yuan dynasty many Muslim communities emerged in China, who practiced a porkless cuisine now preserved by Hui restaurants throughout the country. Yunnan cuisine is unique in China for its cheeses like Rubing and Rushan cheese made by the Bai people, and its yogurt, the yogurt may have been due to a combination of Mongolian influence during the Yuan dynasty, the Central Asian settlement in Yunnan, and the proximity and influence of India and Tibet on Yunnan. As part of the last leg of the Columbian Exchange, Spanish and Portuguese traders began introducing foods from the New World to China through the port cities of Canton and Macau. Mexican chili peppers became essential ingredients in Sichuan cuisine and calorically-dense potatoes and corn became staple foods across the northern plains. During the Qing Dynasty, Chinese gastronomes such as Yuan Mei focused upon a primary goal of extracting the maximum flavor of each ingredient. As noted in his culinary work the Suiyuan shidan, however, the fashions of cuisine at the time were quite varied and in some cases were flamboyantly ostentatious, especially when the display served also a formal ceremonial purpose, as in the case of the Manchu Han Imperial Feast. As the pace of life increases in modern China, fast food like fried noodles, fried rice and gaifan (dish over rice) become more and more popular. A number of different styles contribute to Chinese cuisine but perhaps the best known and most influential are Cantonese cuisine, Shandong cuisine, Jiangsu cuisine (specifically Huaiyang cuisine) and Sichuan cuisine. These styles are distinctive from one another due to factors such as availability of resources, climate, geography, history, cooking techniques and lifestyle. One style may favour the use of garlic and shallots over chili and spices, while another may favour preparing seafood over other meats and fowl. Jiangsu cuisine favours cooking techniques such as braising and stewing, while Sichuan cuisine employs baking. Staple foods in China: Rice, breads and various kinds of noodles. Rice is a major staple food for people from rice farming areas in southern China. Steamed rice, usually white rice, is the most commonly eaten form. People in southern China also like to use rice to make congee as breakfast. Rice is also used to produce beer, baijiu and vinegars. Glutinous rice ("sticky rice") is a variety of rice used in specialty dishes such as lotus leaf rice and glutinous rice balls. In wheat-farming areas in Northern China, people largely rely on flour-based food, such as noodles, bing (bread), jiaozi (a kind of Chinese dumplings), and mantou (a type of steamed buns). Chinese noodles come dry or fresh in a variety of sizes, shapes and textures and are often served in soups or fried as toppings. Some varieties, such as Shou Mian (寿面, literally noodles of longevity), is an avatar of long life and good health according to Chinese traditions. Noodles can be served hot or cold with different toppings, with broth, and occasionally dry (as is the case with mi-fen). Noodles are commonly made with rice flour or wheat flour, but other flours such as soybean are also used in minor groups. Several kinds of soybean products are sold in a farmer's market in Haikou, China. Stir-fried razor shell with douchi (fermented black soybeans) in Jiaodong style. Tofu is made of soybeans and is another popular food product that supplies protein. The production process of tofu varies from region to region, resulting in different kinds of tofu with a wide range of texture and taste. Other products such as soy milk, soy paste, soy oil, and fermented soy sauce are also important in Chinese cooking. There are many kinds of soybean products, including tofu skin, smoked tofu, dried tofu, fried tofu and so on. Stinky tofu is fermented tofu. Like blue cheese or durian, it has a very distinct, potent and strong smell, and is an acquired taste. Hard stinky tofu is often deep-fried and paired with soy sauce or salty spice. Soft stinky tofu are usually used as a spread on steamed buns. Doufuru is another type of fermented tofu that has a salty taste. Doufuru can be pickled together with soy beans, red yeast rice or chili to create different color and flavor. This is more of a pickled type of tofu and is not as strongly scented as stinky tofu. Doufuru has the consistency of slightly soft blue cheese, and a taste similar to Japanese miso paste, but less salty. Doufuru can be used as a spread on steamed buns, or paired with rice congee. Apart from vegetables that can be commonly seen, some unique vegetables used in Chinese cuisine include baby corn, bok choy, snow pea pods, Chinese eggplant, Chinese broccoli and straw mushrooms. Other vegetables including bean sprouts, pea vine tips, watercress, lotus roots, water chestnuts, and bamboo shoots are also used in different cuisines of China. Because of different climate and soil conditions, cultivars of green beans, peas, and mushrooms can be found in rich variety. A variety of dried or pickled vegetables are also processed, especially in drier or colder regions where fresh vegetables were hard to get out of season. Ingredients of Wu Xiang Fen (Five spice powder) are Sichuan peppercorn, cloves, cinnamon, fennel seeds, and star anise. Seasonings such as fresh ginger root, garlic, scallion, cilantro and sesame are widely used in many regional cuisines. Sichuan peppercorns, star anise, cinnamon, fennel, cloves and white peppers are also used in different regions. To add extra flavors to dishes, many Chinese cuisines also contain dried Chinese mushrooms, dried baby shrimp, dried tangerine peel, and dried Sichuan chillies. When it comes to sauces, China is home to soy sauce, which is made from fermented soybeans and wheat. Oyster sauce, clear rice vinegar, chili, Chinkiang black rice vinegar, fish sauce and furu (fermented tofu) are also widely used. A number of sauces are also based on fermented soybeans, including hoisin sauce, ground bean sauce and yellow bean sauce. Egg custard tart is a type of xī diǎn (Western pastry) originally from Portugal and gain its popularity through Macao. Generally, seasonal fruits serve as the most common form of dessert consumed after dinner. Dim Sum (點心), originally means small portion of food, can refer to dessert, pastries. Later to avoid the disambiguation, tian dian (甜點) and gao dian (糕點) are used to describe desserts and pastries. Chinese desserts are sweet foods and dishes that are served with tea, usually during the meal, or at the end of meals in Chinese cuisine. Besides served as a dim sum along with tea, pastries are used for celebration of traditional festivals. The most famous one is moon cake, used to celebrate the Mid-Autumn Festival. A wide variety of Chinese desserts are available, mainly including steamed and boiled sweet snacks. Bing is an umbrella term for all breads in Chinese, also including pastries and sweets. These are baked wheat flour based confections, with different stuffings including red bean paste, jujube and various of others. Su (酥) is another kind of pastry made with more amount of oil, making the confection more friable. Chinese candies and sweets, called táng (糖)  are usually made with cane sugar, malt sugar, honey, nuts and fruit. Gao or Guo are rice based snacks that are typically steamed and may be made from glutinous or normal rice. Another cold dessert is called baobing, which is shaved ice with sweet syrup. Chinese jellies are known collectively in the language as ices. Many jelly desserts are traditionally set with agar and are flavored with fruits, though gelatin based jellies are also common in contemporary desserts. Chinese dessert soups are typically sweet and served hot. There are also western pastries in China, like mille-feuille, crème brûlée and cheesecake, but they are generally not as popular because the Chinese preference of dessert is mildly sweet and less oily. Bāozi are steamed buns containing savory or sweet combinations of meat, vegetables, mushrooms, traditionally associated with breakfast. Many types of street foods, which vary from region to region, can be eaten as snacks or light dinner. Prawn crackers are an often-consumed snack in Southeast China. Chinese in earlier dynasties evidently drank milk and ate dairy products, although not necessarily from cows, but perhaps koumiss (fermented mare's milk) or goat's milk. Many Chinese have until recently avoided milk, partly because pasturage for milk producers in a monsoon rice ecology is not economic, and partly because of the high rate of lactose intolerance among the Chinese population. As such the use of dairy products in Chinese cuisine has historically been rare, with regional exceptions such as the "double skin milk" dessert in Guangdong Province. Today ice cream is commonly available and popular throughout China. Stewed pig's ear as lou mei is usually served cold. Cold dishes are usually served before the main meal. Besides salad and pickles as appetizers, they can range from jelly, beancurd, noodle salad, cooked meat and sausages, to jellyfish or cold soups. Chinese sausages vary from region to region. The most common sausage is made of pork and pork fat. Flavor is generally salty-sweet in Southern China. In other parts of China, sausages are salted to be preserved. Chinese sausage is prepared in many different ways, including oven-roasting, stir-fry, and steaming. In some part of South China, soups are served between the cold dishes and main dishes. In other parts of China, soups are served between the main dish and staple foods, before desserts or fruit salad. Tea plays an important role in Chinese dining culture. Baijiu and huangjiu as strong alcoholic beverages are preferred by many people as well. Wine is not so popular as other drinks in China that are consumed whilst dining, although they are usually available in the menu. Longjing tea, also known as Dragon Well tea, is a variety of roasted green tea from Hangzhou, Zhejiang Province, China, where it is produced mostly by hand and has been renowned for its high quality, earning the China Famous Tea title. As well as with dim sum, many Chinese drink their tea with snacks such as nuts, plums, dried fruit (in particular jujube), small sweets, melon seeds, and waxberry. China was the earliest country to cultivate and drink tea, which is enjoyed by people from all social classes. Tea processing began after the Qin and Han Dynasties. The different types of Chinese tea include black, white, green, yellow, oolong, and dark tea. Chinese tea is often classified into several different categories according to the species of plant from which it is sourced, the region in which it is grown, and the method of production used. Some of these types are green tea, oolong tea, black tea, scented tea, white tea, and compressed tea. There are four major tea plantation regions: Jiangbei, Jiangnan, Huanan and the southwestern region. Well known types of green tea include Longjing, Huangshan, Mao Feng, Bilochun, Putuofeng Cha, and Liu'an Guapian. China is the world’s largest exporter of green tea. One of the most ubiquitous accessories in modern China, after a wallet or purse and an umbrella, is a double-walled insulated glass thermos with tea leaves in the top behind a strainer. The importance of baijiu (lit. "white liquor") in China (99.5% of its alcoholic market) makes it the most-consumed alcoholic spirit in the world. It dates back to the introduction of distilling during the Song dynasty; can be made from wheat, corn, or rice; and is usually around 120 proof (60% ABV). The most ubiquitous brand is the cheap Er guo tou, but Mao Tai is the premium baijiu. Other popular brands Kang, Lu Zhou Te Qu, and Wu Liang Ye. Huangjiu (lit. "yellow liquor") is not distilled and is a strong rice wine (10–15% ABV). Popular brands include Shaoxing Lao Jiu, Shaoxing Hua Diao, and Te Jia Fan. Chinese herb tea, also known as medicinal herbal tea, is a kind of tea made from Chinese medicinal herbs. Soy milk, almond milk, walnut milk and coconut milk are also drunk during the meal in different regions. In some parts of China, hawthorn and jujube juice are preferred. A small shot of fruit vinegar is served as an appetizer in Shanxi. Zhájiàng Miàn (noodles with bean paste) is a traditional northern Chinese dish. It has been spread to South Korea and known as Jajangmyeon. Where there are historical immigrant Chinese populations, the style of food has evolved and been adapted to local tastes and ingredients, and modified by the local cuisine, to greater or lesser extents. This has resulted in a deep Chinese influence on other national cuisines such as Cambodian cuisine, Filipino cuisine, Thai cuisine and Vietnamese cuisine. There are also a large number of forms of fusion cuisine, often popular in the country in question. Some, such as ramen (Japanese Chinese cuisine) have become popular internationally. Deep fried meat combined with sweet and sour sauce as a cooking style receives an enormous preference outside of China. Therefore, many similar international Chinese cuisines are invented based on sweet and sour sauce, including Sweet and sour chicken (Europe and North America), Manchurian chicken (India) or tangsuyuk (South Korea). The Hawaiian pizza was inspired by Chinese sweet and sour flavors. The large population having Chinese ancestors in the United States operates many restaurants, has developed distinctive dishes (such as chop suey) based originally on Cantonese cuisine, while those are not popular among Chinese-American people. The Chinese dining etiquette has that youths should not sit at the table before the elders. In addition to this, youths should not start eating before the elders start eating. When eating with a bowl, one should not hold it with its bottom part, because it resembles the act of begging. Also, when taking a break from eating at the table, one should not put the chopstick into the rice vertically, because it resembles the Chinese traditional funeral tribute, which involves putting chopstick inside a bowl of rice vertically. It is considered inappropriate to use knives on the dining table. Chopsticks are the main eating utensils for Chinese food, which can be used to cut and pick up food. Chinese dishes stress the three main points of appearance, smell, and taste. A really well-cooked Chinese food would need to achieve all three of them. Also, there is teaching of food carving  in Chinese culture, typically using vegetables as materials to carve the sculpture for animals and spiritual beings. In Chinese folk religion, ancestor veneration is conducted by offering food to ancestors and Chinese festivals involve the consumption and preparation of specific foods which have symbolic meanings attached to them. Specific religions in China have their own cuisines such as the Taoist diet, Buddhist cuisine and Chinese Islamic Cuisine. The Kaifeng Jews in Henan province once had their own Chinese Jewish cuisine but the community has largely died out in the modern era and not much is known about the specifics of their cuisine but they did influence foods eaten in their region and some of their dishes remain. The American group People for the Ethical Treatment of Animals has criticized practices in certain parts of the West, Japan and China that involve eating live animals and the consumption of exotic game and bushmeats as forms of animal cruelty. Examples of eating live animals in China include Yin Yang fish (dead-and-alive fish), drunken shrimp, and San Zhi Er (baby rodents). Other controversial dishes in Chinese cuisine includes Cantonese snake soup, dog meat and bear claws. ^ "Beijing cuisine and Peking roasted duck." ChinaTour.Net. Accessed Dec 2011. ^ "Four Major Cuisines in China". CITS. Retrieved 10 January 2017. ^ "Fujian Cuisine. Beautyfujian.com Archived 10 July 2011 at the Wayback Machine. Accessed June 2011. ^ "Braised Shredded Dried Tofu". China Today. 14 June 2011. Retrieved 10 January 2017. ^ Wertz, Richard R. "The Cultural Heritage of China :: Food & Drink :: Cuisine :: Introduction". www.ibiblio.org. Retrieved 2 May 2016. ^ "China to Chinatown". University of Chicago Press. Retrieved 10 December 2015. ^ Anderson (1988), p. 267. ^ Anderson (1988), p. 52. ^ Huang, H. T. (2000). Fermentations and Food Science, Volume 6. Cambridge University Press. p. 474. ISBN 0521652707. Retrieved 24 April 2014. ^ Anderson (1988), p. 143, 144, 218. ^ Simoons, Frederick J. (1990). Food in China: A Cultural and Historical Inquiry. CRC Press. p. 89. ISBN 084938804X. Retrieved 24 April 2014. ^ Free China Review, Volume 45, Issues 7-12. W.Y. Tsao. 1995. p. 66. Retrieved 24 April 2014. ^ Charles Holcombe (January 2001). The Genesis of East Asia: 221 B.C. - A.D. 907. University of Hawaii Press. pp. 129–. ISBN 978-0-8248-2465-5. ^ Schafer, Edward H. (1963). The Golden Peaches of Samarkand: A Study of Tʻang Exotics (illustrated, reprint, revised ed.). University of California Press. p. 29. Retrieved 24 April 2014. ^ Anderson (1988), p. 80. ^ Pearce, Scott; Spiro, Audrey G.; Ebrey, Patricia Buckley, eds. (2001). Culture and Power in the Reconstitution of the Chinese Realm, 200-600. Volume 200 of Harvard East Asian monographs (illustrated ed.). Harvard Univ Asia Center. p. 22. ISBN 0674005236. Retrieved 24 April 2014. ^ Lewis, Mark Edward (2009). China Between Empires. Harvard University Press. p. 126. ISBN 0674026055. Retrieved 24 April 2014. ^ Huang, H. T. (2000). Fermentations and Food Science, Volume 6. Cambridge University Press. p. 511. ISBN 0521652707. Retrieved 24 April 2014. ^ Choo, Jessey Jiun-chyi; et al. (2014), "Everyday Life", Early Medieval China: A Sourcebook, New York: Columbia University Press, p. 434, ISBN 978-0-231-15987-6 . ^ Anderson (1988), p. 91, 178. ^ "Things to Avoid 3: Meals for the Ears (戒耳餐)". Translating the Suiyuan Shidan. Retrieved 8 March 2015. ^ "Things to Avoid 12: Cliché (戒落套)". Translating the Suiyuan Shidan. Retrieved 8 March 2015. ^ "Regions of Chinese food-styles/flavors of cooking." University of Kansas, Kansas Asia Scholars. Accessed June 2011. ^ "China's Culinary Diversity in One Map"
^ a b J. Li & Y. Hsieh. Traditional Chinese Food Technology and Cuisine. Asia Pacific Journal of Clinical Nutrition. 2004;13(2): 147–155. ^ Ma, Guansheng (December 2015). "Food, eating behavior, and culture in Chinese society". Journal of Ethnic Foods. 2 (4): 195–199. doi:10.1016/j.jef.2015.11.004. ^ ""Top 10 basic ingredients for Chinese cooking."". Archived from the original on 30 May 2010. Retrieved 30 May 2010. CS1 maint: BOT: original-url status unknown (link) [The Times]. Accessed June 2011. ^ Yan, Martin. "Chinese Cooking For Dummies". Retrieved 23 February 2013. ^ Lin, Kathy. "Chinese Food Cultural Profile". Retrieved 23 February 2013. ^ Fu Pei-Mei (2010). Pei-Mei's Chinese Cook Book Volume 2. Menlo Park, CA: Askmar Publishing. ISBN 978-1-935842-05-7. ^ Jurafsky, Dan (6 October 2009). "The Language of Food: Dessert". The Language of Food. Retrieved 16 March 2017. ^ Wertz, Richard R. (2016). "Food & Drink: Cuisine". The Cultural Heritage of China. Retrieved 17 March 2017. ^ "Daoxiangcun - Introduction of Beijing Local Special Product" (in Chinese). Visit Beijing. Retrieved 11 January 2017. ^ a b c d e "Chinese Desserts." Archived 2 July 2011 at the Wayback Machine Kaleidoscope - Cultural China Archived 11 July 2011 at the Wayback Machine. Accessed June 2011. ^ Jack Goody, Cooking, Cuisine, and Class: A Study in Comparative Sociology (Cambridge; New York: Cambridge University Press, 1982), p. 107; Chang, ed., Food in Chinese Culture: Anthropological and Historical Perspectives, 7, 25, 105-06. ^ Parkinson, Rhonda. "How To Cook Chinese Sausage". Retrieved 23 February 2013. ^ a b c Q. Hong & F. Chunjian. Origins of Chinese Tea and Wine. Asiapac Books Pte Ltd. 2005.ISBN 9812293698. ^ a b Zonglin Chang Xukui Li. Aspect of Chinese Culture. 2006.ISBN 7302126321, ISBN 978-7-302-12632-4. ^ The Economist. "Daily Chart: High Spirits". 17 June 2013. Accessed 9 August 2013. ^ Wulin,, Ji,; 紀戊霖, (2010-02-03). Zhong yao cai cha liao shi dian. Tai bei xian xin dian shi: Yuan hua fa xing chu ban fa xing. ISBN 9789866612794. OCLC 815400238. ^ "Why the length of chopsticks are 7 cun 6 fen?" (in Chinese). KK News. 2016-09-02. Retrieved 2018-06-11. ^ "Why Chinese use chopsticks while Westerners use knives and forks?" (in Chinese). Sina Zhishi. 2017-02-16. Retrieved 2018-06-11. ^ "Chinese food carving". cchatty. Retrieved 2018-01-29. ^ 《易》曰：君子以飲食宴樂。又曰：君子慎言語，節飲食。; “Yì” yuē: Jūnzǐ yǐ yǐnshí yàn lè. ^ "The world's cruelest dining experiences revealed". New Zealand Herald. 23 November 2016. ^ Zhang Qifeng; Jiang Gan; Liu Xun (18 December 2012). "Eating habits in south China driving endangered animals to extinction". Chine Dialogue. Chang, Kwang-chih (1977). Food in Chinese Culture: Anthropological and Historical Perspectives. New Haven: Yale University Press. ISBN 0300019386. David R. Knechtges, "A Literary Feast: Food in Early Chinese Literature," Journal of the American Oriental Society 106.1 (1986): 49-63. Swislocki, Mark (2009). Culinary Nostalgia: Regional Food Culture and the Urban Experience in Shanghai. Stanford, CA: Stanford University Press. ISBN 9780804760126. Waley-Cohen, Joanna (2007). "Celebrated Cooks of China's Past". Flavor & Fortune. 14 (4): 5–7, 24. Archived from the original on 2 April 2015. Endymion Wilkinson, "Chinese Culinary History (Feature Review)," China Review International 8.2 (Fall 2001): 285-302. Buwei Yang Chao. How to Cook and Eat in Chinese. (New York: John Day, 1945; revisions and reprints). Fuchsia Dunlop. Land of Plenty : A Treasury of Authentic Sichuan Cooking. (New York: W.W. Norton, 2003). ISBN 0393051773. Fuchsia Dunlop. Revolutionary Chinese Cookbook: Recipes from Hunan Province. (New York: W.W. Norton, 2007). ISBN 0393062228. Fuchsia Dunlop. Shark's Fin and Sichuan Pepper: A Sweet-Sour Memoir of Eating in China. (New York: Norton, 2008). ISBN 9780393066579. Emily Hahn, Recipes, The Cooking of China. (Alexandria, Va.: Time-Life Books, Foods of the World, 1981). Hsiang-Ju Lin and Tsuifeng Lin. Chinese Gastronomy. (London: Nelson, 1969; rpr.). ISBN 0171470575. Yan-Kit So. Classic Food of China. (London: Macmillan, rpr 1994, 1992). ISBN 9780333576717. Martin Yan. Martin Yan's Chinatown Cooking: 200 Traditional Recipes from 11 Chinatowns around the World. (New York: Morrow, 2002). ISBN 0060084758. Georgina Freedman. Cooking South of The Clouds: Recipes and Stories From China's Yunnan Province. (Octopus; Kyle, 2018). ISBN 9780857834980. Wikivoyage has a travel guide for Chinese cuisine. "Chinese Culinary History (Websites for Research) Stony Brook University Libraries. This page was last edited on 17 April 2019, at 18:54 (UTC).